Enma's daughter Batsu is looking for help to take down some demons. And who does she turn to...? Normal teenager Takuan! 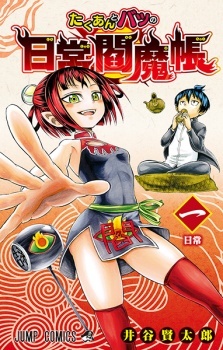 As a part of the JUMP START initiative, the first three chapters of Takuan to Batsu no Nichijou Enmachou were published in English as Takuan and Batsu's Daily Demon Diary in VIZ Media's digital Weekly Shonen Jump on the same day as the Japanese release.